Paced by their two-headed monster out of the backfield, the New Orleans Saints ran by the Carolina Panthers, 31-21 in a pivotal NFC South divisional game. Rookie phenom Alvin Kamara carried the ball just nine times, but recorded 60 yards and two touchdowns on the ground while Mark Ingram ran the ball 14 times for 85 yards and another score. The running back duo also added 11 receptions for 103 yards as the QB Drew Brees completed 25-of-34 passes for 269 yards and a touchdown. Panthers QB Cam Newton threw for two scores himself, but it wasn’t enough as the Panthers fell a game behind the Saints in the NFC South race. With that, we give you our PFF-exclusive takeaways from the contest for each team. 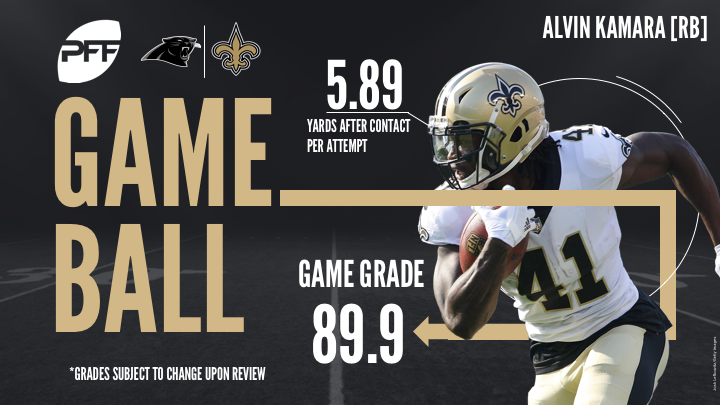 Another week and another high grade for Alvin Kamara. Against the Panthers, he forced five missed tackles on the ground on just nine carries and missed tackle on a catch while averaging 5.89 yards after contact for a ridclous 252.4 elusive rating. Drew Bress played another game this season where he might not had been spectatcular but he was very solid in moving the chains and only threw one turnover worthy throw all game, while creating enough big plays to keep the Panthers from selling out on the run. Crawley was beat by a very-well placed Cam Newton ball along the sidelines late in the fourth quarter for a Devin Funchess touchdown (that could have possibly been prevented had Kenny Vaccaro hit the gas pedal a bit harder) but he was excellent throughout the afternoon. When things were all said and done, Crawley surrendered three catches on six targets for 42 yards to go with two pass breakups and a stop. Crawley has teamed up with rookie sensation, Marshon Lattimore, this season to give the Saints one of the best corner duos in the league, Crawley now ranks 11th with an 86.9 overall grade this season after Sunday’s performance. Jordan tallied three pressures in this one (all hurries) to keep his season-long streak alive: he’s finished every game this year with multiple pressures, a streak that acutally dates all the way back to Week 7 of last season. Jordan also finished the afternoon with three stops and he’s now averaged three stops per game over the last three weeks after failing to record a stop in Week 10. Cam was especially effective on Sunday afternoon when the Saints chose not to blitz, completing 12-of-14 passes for 131 of his yards and both touchdowns (good for a 145.2 passer rating) on throws where New Orleans dropped at least seven guys back into coverage. The Panther’s QB missed on both of his throws that traveled at least 20 yards in the air in Week 13 but he was mostly sharp underneath, connecting on 17-of-22 passes that traveled 19 or fewer yards in the air. Williams’ breakout season continued with another solid game this week. The third-year tackle led the Panthers offense in terms of overall grade after he put up a clean sheet in pass protection to go with a team-high 77.6 run blocking grade. Williams now ranks fourth among tackles this season with an 85.3 overall grade. Even through the Panthers had the issue in the run game, it was not the fault of Kuechly, who recorded six run stops and two more stops in the passing game. He did all this without missing a tackle as he was flying to get to the ball carrier, play in and play out. Second-year corner Daryl Worley had his best game of his short career. Worley only played 29 snaps, 19 of which where in coverage. Worley was targeted three times allowing just one catch for three yards and knocking down the other two targets. All three targets came when covering Michael Thomas. The only downside was the inability to bring in the ball on a poor throw by Brees when he was covering Thomas in the fourth quarter.